The Cumberland Lake tailwater provides some of the best Rainbow and Brown Trout fishing in the southeastern United States . Beginning at Wolf Creek Dam, the Cumberland River supports over 75 miles of trout fishing, producing average size trout of around 14″ and many daily trophies ranging from 18″ to 20″ and larger. 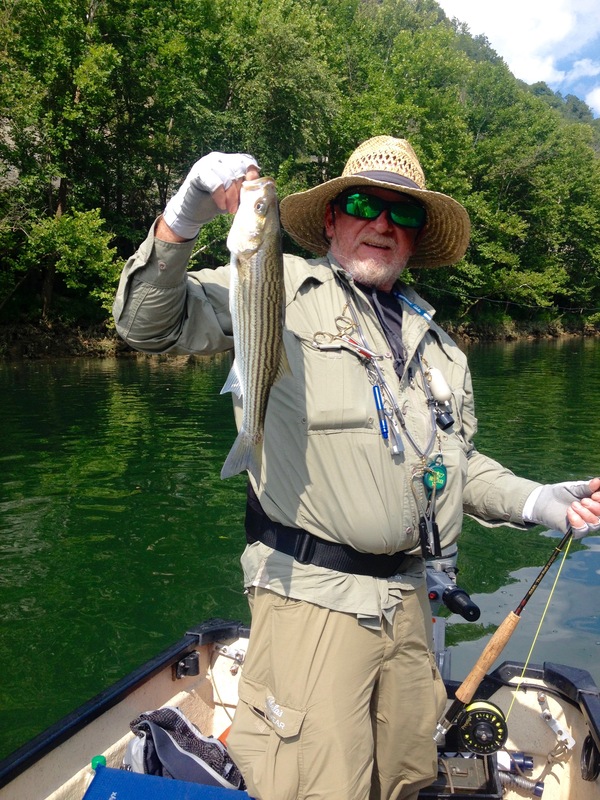 In addition to trout fishing, anglers can also test their skill going after the massive Striped Bass that also inhabit the cold waters of the Cumberland River .The Kentucky Fish & Wildlife Department stocks almost 200,000 rainbow and brown trout in the Cumberland River each year, and progressive slot and creel limits ensure that many grow to great sizes. The Wolf Creek Hatchery is located near Wolf Creek Dam and produces all of the trout used in stocking streams and lakes throughout the state. There are daily tours at the hatchery, which is a must see for anyone visiting the area. In addition, DCFF is involved with the hatchery by providing volunteers to help with the fin clipping on several occasions throughout the year. As many of you are aware, the U.S. Army Corps of Engineers recently completed a long-term repair project on a critical seepage problem with the Wolf Creek Dam. Summer lake levels are now back to normal and you can expect the TVA to operate with a “normal” schedule and generate electricity during high demand periods of the day. As with any tailwater, the key to fishing the Cumberland River is to pay close attention to water levels and generation schedules. While current conditions can be determined with some reliability, trying to guess upcoming generation patterns is an inexact science at best. Generation decisions are based on a complex and ever-changing mix of parameters, including power needs, flood/water level control in the Cumberland and interconnected upstream and downstream basins, and a number of other factors like rainfall. While some of these variables are nearly impossible to predict, it is possible to gain information from a variety of sources that can help you piece together an educated guess of river levels on a given section of the river. The links along the right side of this page will direct you to several good sources for this information. The Long Range Forecast will give you planned average release rates for 10 days. The Wold Creek Dam Generation schedule gives hour-by-hour predicted generation for the coming day, with the next day’s forecast typically posted by mid-afternoon on the previous day. While predicted generation schedules usually hold true, they are always subject to change. It’s a good idea to call on the morning of your trip to make one more check of the latest schedule. Call the Wolf Creek Dam for current information. Use the “Estimated Water Arrival Time” link in conjunction with these others to estimate when the water that flows through the dam at any given time is likely to arrive at various points downstream. 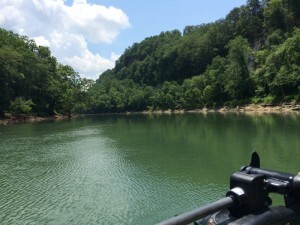 The link at the right titled “How to get almost anywhere on the Cumberland River” contains excellent information regarding access points to the Cumberland for both the wading and boating fly fisher. The Cumberland River tailwater starts at Wolf Creek Dam in the little town of Jamestown , KY. Wade fishing opportunities begin as close as the boat ramp immediately below the dam, with wadeable stretches above and below the ramp during periods of low water. Other opportunities for parking and walk-in access include the boat ramp at Helm’s landing, where you’ll often find DCFF members. Regardless of where you wade, it is critical to be alert to changing water levels. Published generation schedules are always subject to change, so it’s dangerous to rely solely on those. Be sure to make a mental note of the path you took to your spot in the river, so you can backtrack if needed in the face of rising water. Pick out an object on the bank to use as a reference point, observing the water level when you enter the river, or place an easily visible object on the bank at the water line to serve the same purpose. In either case, if you observe the water rising relative to your reference point, begin working your way back to the bank. Wading staffs are invaluable as a means of probing ahead and avoiding stepping into water that’s deeper and swifter than anticipated. Oftentimes, a change in water level due to generation can be felt and observed on the water as well, but this possibility should not be relied on as a substitute for reference points on the bank. While in the water, if you feel a sudden surge of colder water, notice a light fog forming, or see an increase in leaves or other debris in or on the water, these are likely signs of a surge of cold water through the dam and corresponding rising water levels. If you have access to a flat bottom boat, such as an aluminum jon boat, you can gain access to many places not available from the road. If you are boating, use extreme caution while running the river. Keep in mind, the river has many very shallow gravel bars and navigation in some areas is often impossible depending on the river levels. Also be aware of large submerged boulders and trees as they are also common in the river. The Cumberland River also experiences dense fog on a regular basis, especially during the summer months. Boaters need to be extremely cautious during these times and slow down. Wading anglers and small canoes can appear out of nowhere and are easily swamped or injured by boat wakes. Watch the water levels during the day to make certain you don’t find yourself beached on a gravel bar due to falling water or trapped in the same circumstances with a gravel bar between you and your boat ramp. A shallow draft boat such as a 16′ flat bottom with a 25hp outboard motor is a great setup for the Cumberland River as they can be portaged by foot over very shallow rocks. A common float is to put in at Winfrey’s Ferry and navigate upstream to Helms Landing. By motoring upstream, you gain the ability to drift back down to your boat ramp if you should experience any boat trouble. This float will take most of the day to come back down and cover the great fishing areas such as Rock House and Rainbow Run. Long Range Wolf Creek Dam release forecast. When will the water get there after generation starts?